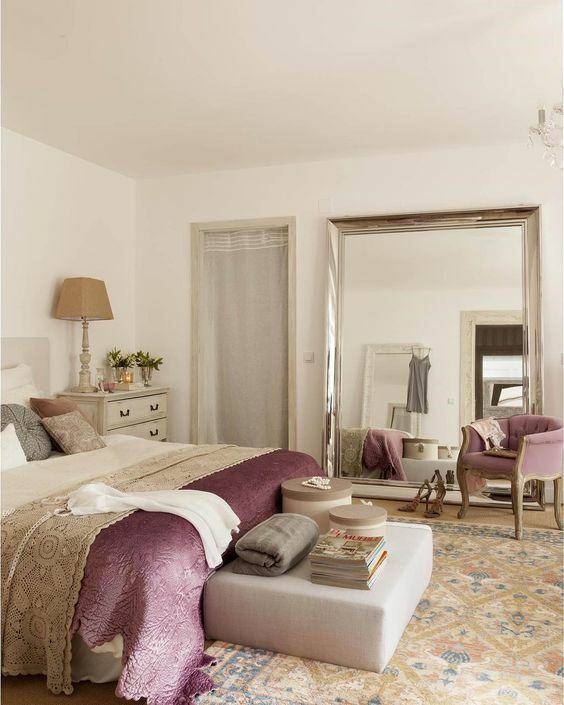 Bedroom mirrors are more than decorative accents. With good mirror placement your bedroom will look bigger, reflect more light and create a functional space for dressing, hair and make-up. Most bedrooms need at least two mirrors, a small mirror and a full-size, body-length mirror. One is for detailed, close use for hair and make-up and the other for long range use, like helping you to co-ordinate outfits. But bedrooms mirrors can also help to create illusions like making a small room look bigger or a dark, moody bedroom to look brighter. Their decorative style supports the mood, decor and color palette of your room. 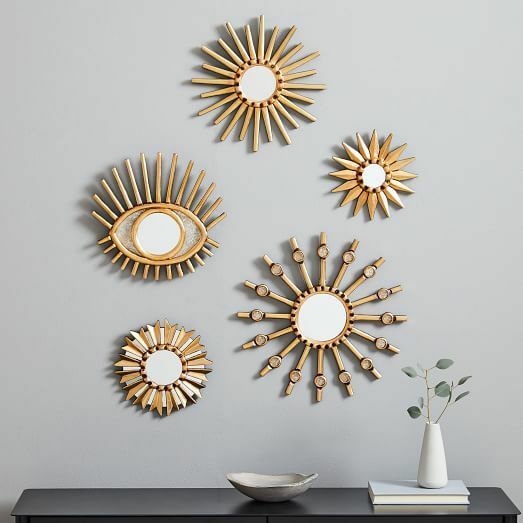 If you only have small mirrors to work with try positioning them at eye-level or above, either in a row, as a group collage, spaced evenly apart. If you are restricted to one mirror, its best to choose a full size large mirror which will help you with all tasks. 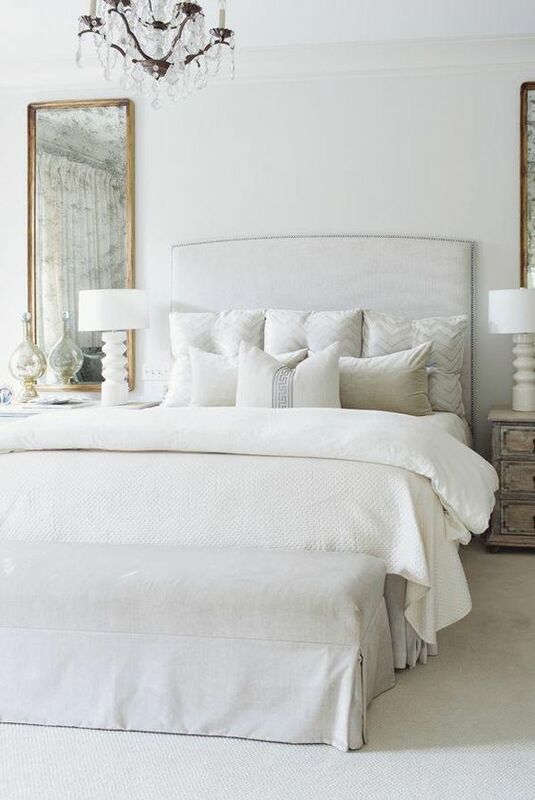 If you don't need to make your bedroom look bigger or brighter, focus instead on using your bedroom mirrors for decor to beautify and create interest your bedroom. A small mirror placed on a nightstand or dresser is always available for small tasks like styling your hair, adding make-up, adding jewelry and even doing your tie. 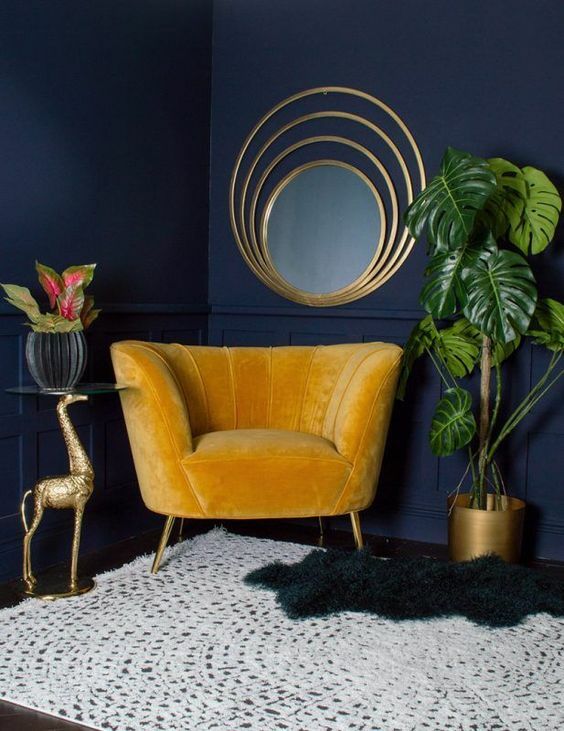 There are many mirrors you can buy or you can re-purpose an old mirror by staining, repainting, or decorating it with fabric, paint, wall paper or peel and stick tiles. You can also find recycled materials to make, or contract a local craftsman to make, a unique mirror for your room. Small mirrors are a way to add light into dark corners. The effect is to make the room feel bigger. Gold and brass accents are big this year and contrast beautifully against popular dark bedroom walls. They bring dead corners to life. 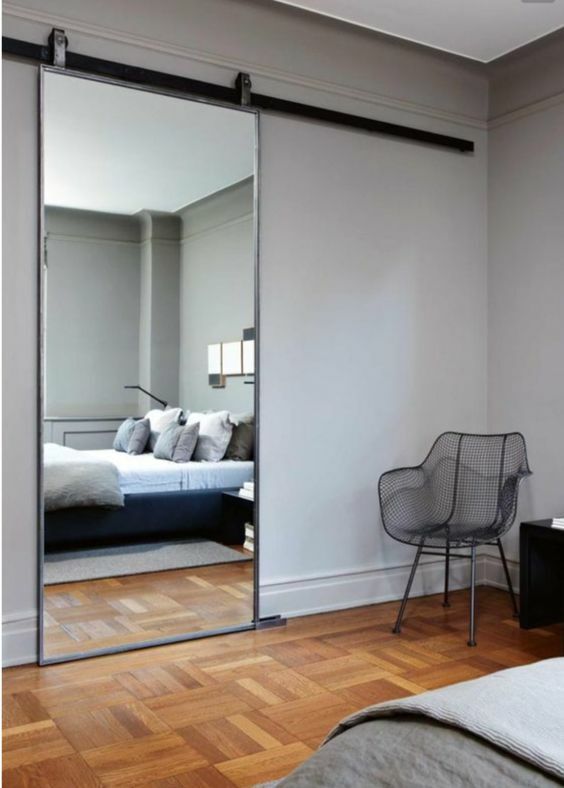 Using a stand alone mirror you can create a feature or focal point in your bedroom where none exists to ground your room and give it character. Experiment with mirrors of different size and shapes. You can position them together as a collage or place them apart. You can also add them to art, images or pictures on you wall to look like an art installation. There is no minimum or maximum number of mirrors or pieces to add, but depending on the size of the pieces and the size of your room, it can look cluttered if you squash to many items together. 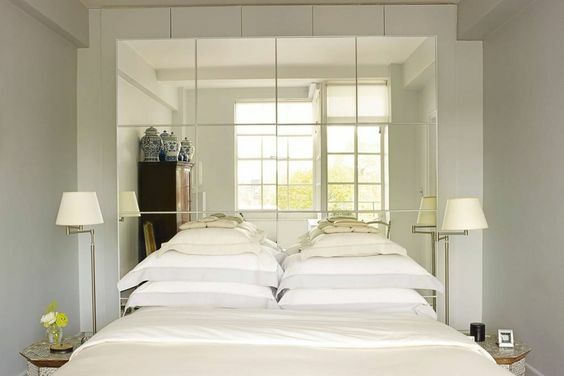 A very effective way to make a small bedroom appear larger is by placing mirrors directly opposite from one another. This creates the illusion of depth. Larger mirrors are best. Adding a large mirror opposite your doorway will reflect the outside hallway. This will make your bedroom appear larger. Its an illusion that works well for both tall mirrors and small mirrors too. 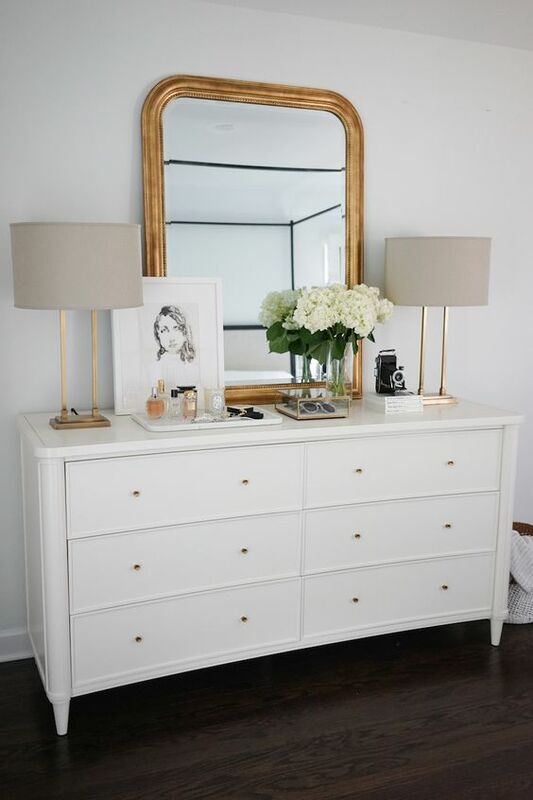 Adding a mirror to furniture like a dresser or tabletop will reflect light into the room to make the room feel larger. You can add it to wardrobe or closet doors. Positioning the mirror opposite your window will add more light to your room and brighten it by reflecting the natural light from your window. 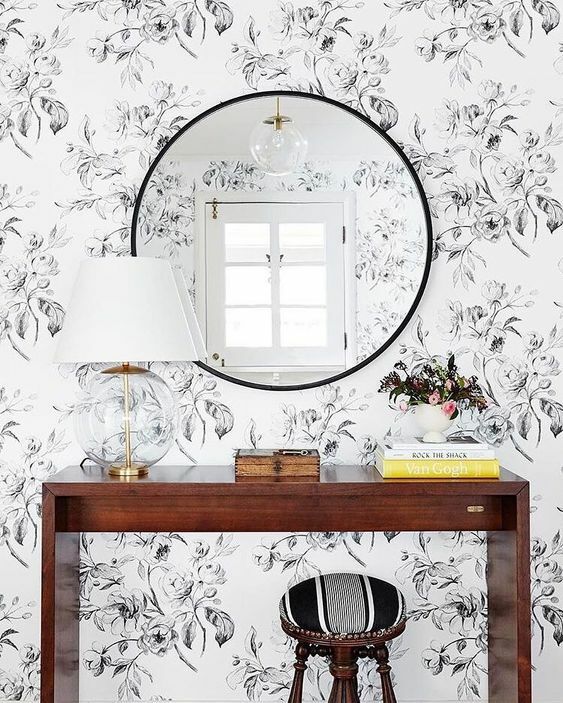 You can create the same effect by placing a similar size mirror on an opposite wall. It will capture natural light and reflect it into the room but not as much light, as being positioned directly opposite. 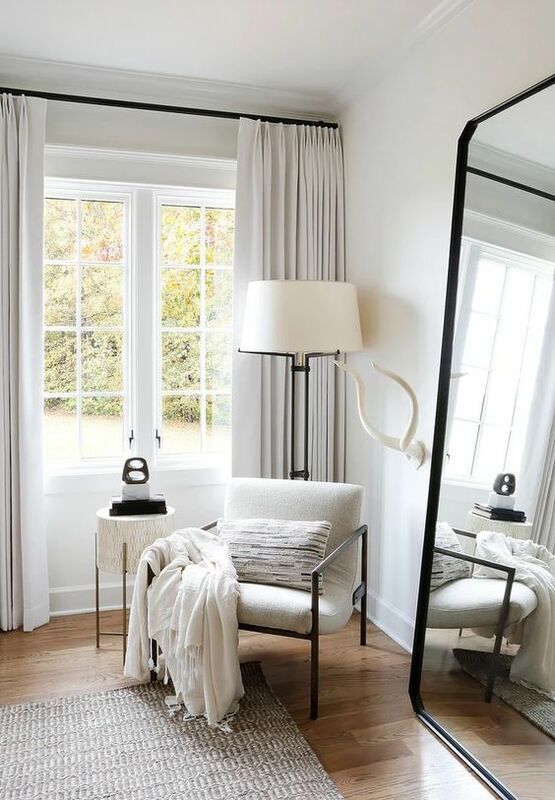 Placing mirrors in different locations where you can play with the angles of light will help you to harness the natural light from the windows and move it around the room and make it feel bigger and brighter. 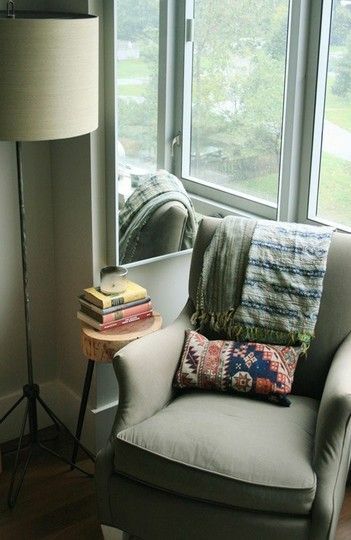 Placing a mirror next to your window reflects light into the bedroom and makes the outside area look bigger. The larger the mirror the better the effect, and window and mirrors that are a similar size work the best if they are situated a few inches apart. 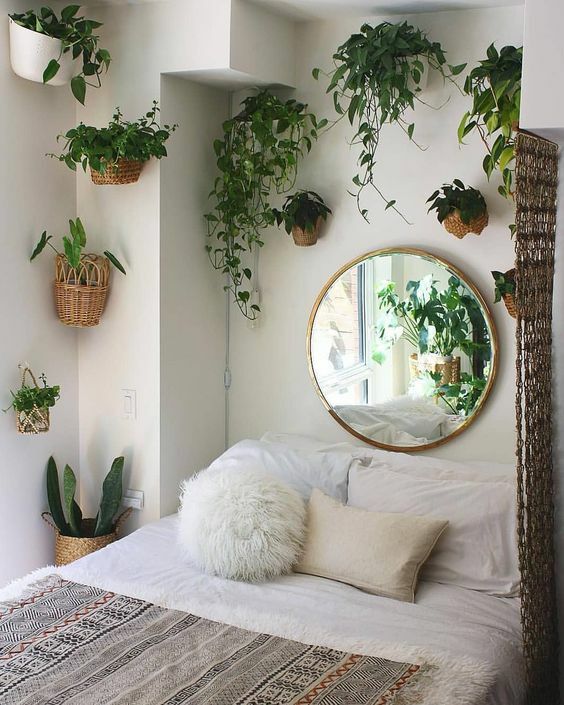 These are a few ways you can use bedroom mirrors to make your room feel bigger, brighter and add those decor touches to make your bedroom more functional. There are other ways to add more natural light to your bedrooms and if you have a small or dark bedroom, they are worth investigating. Especially if you have dark walls or if your bedroom receives very little natural light. Remember to add good lighting fixtures to your bedroom. It helps to create a lovely relaxing mood and you will create a bedroom with even more functionality.